Donning a crooked smile and wearing messy, bright red lipstick while crooning off-key, Colleen Ballinger ’08 became an overnight YouTube sensation. Today, more than two years after her first video went viral, fans still can’t get enough. Ballinger’s unexpected journey began in 2008 when she created the hopelessly awkward, utterly self-absorbed character Miranda. She posted videos showcasing Miranda’s “talent” as a singer under the YouTube account mirandasings08. Despite her whirlwind week, Ballinger returned home convinced that her trip marked the end of Miranda. Little did she know the connections she made with agents would keep her career as a performer, and her character Miranda, alive and well more than two years later. Since then, Ballinger has improvised to keep her act fresh, taking it to fans in Australia, Canada, England, Ireland, and throughout the U.S. She’s performed with the Rock of Ages cast and given a dance lesson to the kids in Billy Elliot. While Ballinger said she loves every performance, her highlight came when she sang with her idol, Broadway legend Sutton Foster, at a 2010 benefit for the Alzheimer’s Association. 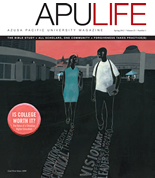 Originally published in the Spring '12 issue of APU Life. Download the PDF or view all issues.